Witness Lightning before the storm: Lightning, the protagonist of the popular FINAL FANTASY XIII, will be introduced to the DISSIDIA series for the first time. 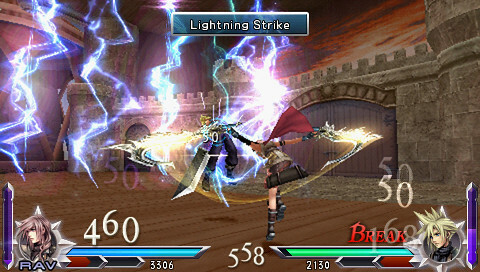 Players can enjoy a taste of the latest installment through a unique scenario featuring Lightning that will recount the events leading to DISSIDIA 012[duodecim] FINAL FANTASY. Carry-over items from DISSIDIA duodecim prologus FINAL FANTASY to DISSIDIA 012[duodecim] FINAL FANTASY: Players can continue their journey and have the advantage of carrying over in-game items acquired in DISSIDIA duodecim prologus FINAL FANTASY for use in DISSIDIA 012[duodecim] FINAL FANTASY. Unlock a new character: By purchasing DISSIDIA duodecim prologus FINAL FANTASY, players will also receive the immensely popular Aerith Gainsborough from FINAL FANTASY VII as an Assist Character in DISSIDIA 012[duodecim] FINAL FANTASY. Awesome. Thanks for the info Ryu. Can't wait for this! Wait . . . What!? Good, i was wondering when they were going to release the US version of this. They should have done it sooner though. I agree, sooner would have been nicer as I already played through it with the japanese version. I have a general question though - in Canada we're getting screwed over by square-enix not giving us any pre-order bonus costumes like the US has - my question is is it possible to download dlc 'else-where' and install it to the game? FYI, I bought Dissidia 012 prologus off of PSN last night and under 6.20 TN-D with version spoofing enabled I get the "you must update to at least version 6.30 to play this title" error message. As of right now, I can still connect to PSN and the store from the device without a problem. has anyone got the official version of this running on CFW?